To be absolutely accurate, this is Mr Golden Pudding’s (let’s go with Mr GP from now on) favourite muesli rather than mine. In fact, I’m not really much of a muesli person, or a cereal person, or even an ‘I know what I want to eat every morning’ sort of person…..Mr GP however, is all three. Some years ago he used to eat a particular brand of bought muesli until we noticed that what used to be dried apricots and other dried fruit was increasingly nothing but crystallised pawpaw, and there wasn’t really much else in it…. So I decided to try and come up with a combination that was both yummy and also chock full of goodies (nutritionally speaking) given he is eating it every single morning! 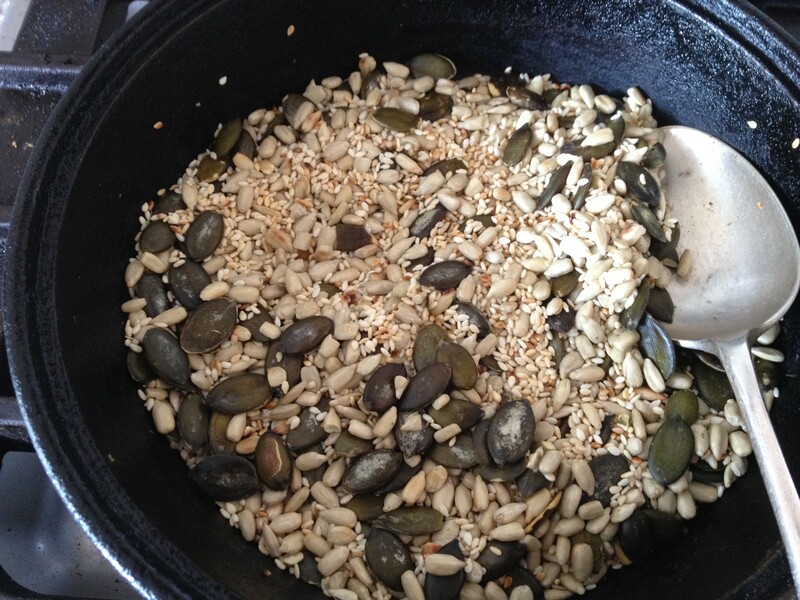 There are probably thousands of muesli recipes out there, but what I particularly like about this one is the variety of flavours and textures, and the extra crunch you get from toasting the seeds (and nuts if using). Before I leap into the recipe, note that this is (obviously) based on his particular preferences, and therefore only includes a small amount of puffed cereal, no nuts, and lots of dried fruit. If you don’t share his preferences (and, like me, love nuts and puffed things when eating muesli) you could easily double the puffed grains and add 200g of lightly toasted nuts – almonds and hazelnuts would go well. I almost always include sultanas as one of the fruit, but the figs and apricots could be substituted with dried pears, cranberries, cherries, peaches or anything else you prefer. The basic proportions in this stay more or less fixed, but I do vary the specific add-ins depending what I have in the pantry. I also try to have as much variety as possible i.e. not using the same grain both rolled/puffed. For the rolled grain I’ve variously used triticale, rye, barley or similar, trying not to use ones like rice flakes that are often tough unless cooked. And if you don’t have wheat flakes, crushed up weetbix work well! For the puffed cereal, I try to stick to the smaller grains or else they tend to float to the top rather than mixing in – amaranth, sorghum, quinoa, millet or a mix are all good. Toast pumpkin, sunflower and sesame seeds in a dry frying pan until sunflower and sesame seeds are golden brown. Leave to cool. Chop large fruit such as dried apricots or figs into bite sized chunks. 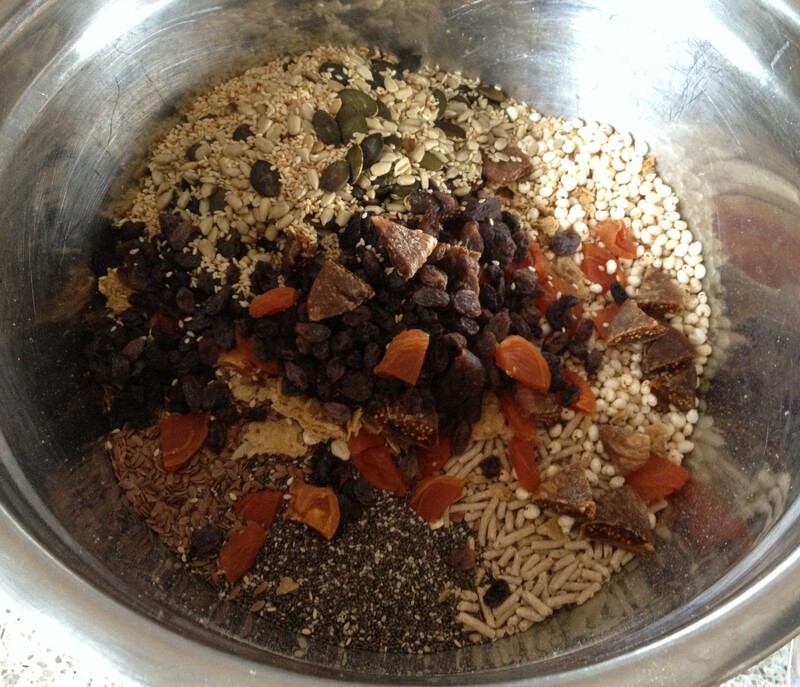 Combine all ingredients in a large bowl, and mix until evenly combined. Store in a large airtight container for up to a month. Serve with either milk or yoghurt and extra fresh fruit – it’s also great soaked overnight as a bircher style muesli. I never get tired of eating muesli, it’s delicious in all of it’s incarnations…although oddly enough I never eat it for breakfast though. Always as a snack. This is about the only way I like buckwheat . . . raw or toasted . . . and sometimes thrown in with pasta aka kasha . . . . . when long cooked I find it gummy and weird tasting, and the flour I can only use in part. This looks amazing and really delicious! 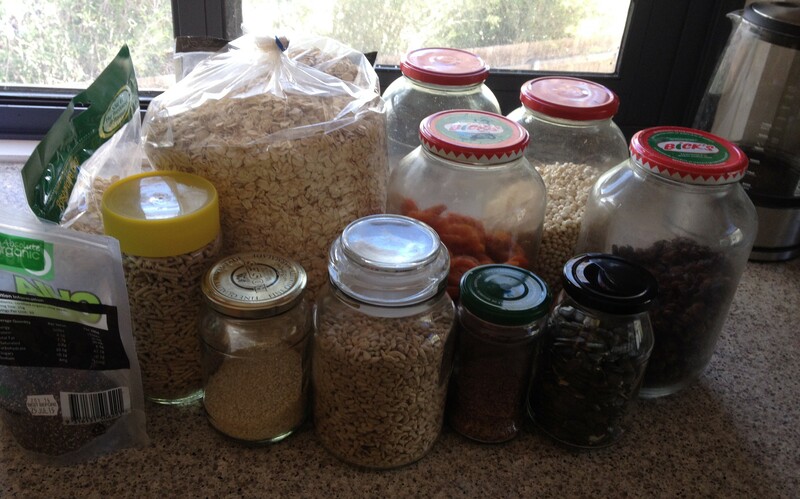 I have been making your muesli for years now. I love its superfood capacity – chia, buckwheat, dried blueberries, cranberries etc. as well as the sheer variety of different grains, nuts, seeds. Unlike Mr GP, I love throwing in Brazil nuts and recently, home grown macas, as well as almonds and wherever other nut is in the cupboard. We always throw in fresh fruit and yoghurt, so that breakfast really IS a kick start to every day. Thanks for sharing!